Ayrton Senna’s 15-year-old record for a lap of Donington Park has fallen during testing for the forthcoming A1GP season, with Malaysia’s Fairuz Fauzy the new record-holder. With Formula One not returning to Donington since the rain-soaked 1993 European Grand Prix, which Senna won after storming into the lead on the first lap, the longevity of his lap record was perhaps unsurprising. But in the run-up to the planned return of F1 in 2010, two newer open wheel series have used the circuit for tests and racing – and that made it only a matter of time before someone outpaced than the Brazilian legend, whose statue stands at the circuit. First Superleague Formula took its newly-designed Elan Motorsport machines there for a full race weekend. Then A1GP arrived to allow some of its teams to test its new Ferrari-powered and inspired cars. 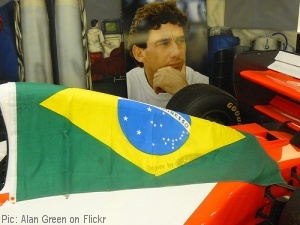 Senna’s record survived the attack of the football-themed series, which saw its race day engulfed in rain. But it fell to the self-styled World Cup of Motorsport, according to A1GP’s newly-released data for a session involving six national cars plus the series test car. Since the two events happened barely two weeks apart, under English weather reminiscent of Senna’s triumphant drive, we thought it would be interesting to compare the lap times put in by the two sets of drivers and see how they shaped up to the McLaren MP4/8. Of course, the comparison isn’t perfect. We’ve plotted A1GP testing against Superleague qualifying because we didn’t have access to test times for the latter series and its race day was too wet to offer a fair comparison. We used the fastest time set by each Superleague Formula car across the whole of qualifying, whether it was in the group or knock-out stages. Also it’s necessary to take the differences between the two cars into account. The A1GP car is based on Ferrari’s F2004 and powered with a 600-bhp V8 engine from that manufacturer. The Superleague Formula car is the creation of Elan Motorsport and features a 750-bhp V12 from Menard Competition Technologies. In both series, unlike Formula One, all drivers are racing with identical cars. And because conditions will vary on the day it can never be totally accurate to compare racing events that took place on different days. However, this is probably the closest we’ll get for a long time, so definitely an exercise with some value. Lap times at Donington - Senna in yellow, A1GP in blue and Superleague Formula in red. So what does it prove? Well, the A1GP teams have only just got their hands on their new car and they’re already faster than the Superleague Formula V12s. Give them some more time, and they’ll doubtless get quite a bit more speed out of them. But only the very fastest of them managed to beat a time set 15 years ago on a wet day, which may say something about the quality of their cars – but is far more likely to demonstrate the quality of the driver who set that time. Categorised under A1GP, F1, Superleague Formula, tagged under A1GP, Ayrton Senna, Donington Park, Formula One, Superleague Formula, videos. Over the white line: Send the British GP to Portimao!